With just over 3 weeks to go until the General and Local Elections take place I have found it useful to take 5 minutes between putting letters and statements together, preparing for hustings and leaflet drops as well as canvassing, to reflect on the changed mood from last year. One of the first things that I have noticed this year is the diminished support for UKIP when speaking to people on doorsteps. It was to be expected that UKIP would be prominent in last year’s elections as the local elections ran concurrently with the European Elections but one thing that has been striking this year has been the lack of vocal support this year compared to last year for UKIP. I have had conversations with a number of people who have expressed support for UKIP, more as a protest vote than anything else, but there has been a marked drop in self-proclaimed UKIP supporters or voters. This seems at odds with the giant billboards, masses of leaflets going out as well as the seemingly full-time commenting on local news websites of some UKIP supporters. However, this will all have been paid for by millions which have been provided by rich donors that were once loyal to the Conservatives. Something else I have noticed is a lack of canvassing and grass roots campaigning by the other parties. I have spoken to plenty of people who almost seem surprised that a rosette wielding Socialist is knocking at their door of an evening until I point out that there’s only 3 weeks to go until polling day. Again, there are plenty of billboards from all of the Capitalist parties being erected across the city in an almost clandestine turf war but this seems to be the extent of it. The battle for hearts, minds and political ideas seems to have been reduced to an almost clinical advertising campaign. One other very encouraging difference I have noticed in this election compared to last year is that these elections are much more political than in previous years. It is clear now more than ever before, at least in the course of my political experience, that people are searching much more deeply for a political outlet which best represents their increasingly irked voice. 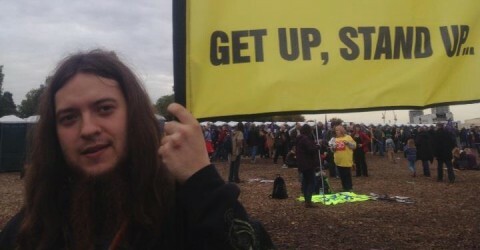 There is a clear rejection of the tired swing from Labour to Conservative and back again as more and more people are looking to parties that can offer a way out of the protracted crisis caused by the current rut Capitalism finds itself in. Some have been pulled in by the simplistic and mistaken view that immigration is the cause of every societal woe, whether it’s overcrowded schools, the stagnant wages or the alleged influx of health tourists “burdening our NHS” offered by a rightwards lurching UKIP. Others are turning to the seemingly refreshing views of the Greens, who have lurched leftwards in their rhetoric with promises to end austerity and promise of a minimum wage of ₤10 an hour by 2020. Yet when the Greens have been in a position to end austerity, such as in Brighton and Hove or Bristol, they have capitulated and joined an increasing rainbow coalition of austerity wielding parties. Not to mention that ₤10 an hour is needed now, not some time in the distant future. There is a dwindling rump of support for the Conservatives and Labour, mainly made up of stalwarts and party faithfuls that have not yet come to terms with the fast changing political landscape. Things cannot go back to the way they used to be. Labour seem to be desperately trying to shed its working-class base as it has spent more and more of its time marketing itself to big business with continued austerity whilst opportunistically also offering rhetoric about communities and helping the most vulnerable. This flies in the face of the reality of Labour councils which have dutifully implemented austerity passed down to them by the Con-Dems. Likewise, the Conservatives have not managed to attract voters beyond its core support as most people are under no illusions about us all being in this together after 5 years of wages, terms, conditions and public services being hammered. It’s hugely encouraging to be out canvassing on the streets and being greeted, on the whole, with a barrage of questions as it is clear that the working-class are really starting to explore the potential avenues for them to venture down on the political plain. Fed up with more of the same or petty compromises working-class people are looking for a way out of the sustained poverty and misery being unnecessarily inflicted upon them. As a Socialist Party member and TUSC candidate in the local elections this May I am glad to be there offering a genuine alternative to austerity through the striving for a socialist transformation of society. The ground is fertile for our ideas, having spent just an hour canvassing we were able to pick up 6 contacts as well as a much larger number of people who said they would seriously consider casting a vote for us this May. Even more inspiring was the presence of a Norwegian student in attendance at our latest branch meeting, directly as a result of our sustained campaigning efforts. Keen to learn more about what the Socialist Party, and indeed the Committee for a Workers’ International, has to offer, I am confident that this can be replicated many times. We are turning more and more heads in this election and more importantly gaining new members and organisers. This will really accelerate the process of building a strong workers’ movement hungry from poverty, hungry for change… hungry for socialism. I would like to dedicate this post to Declan Clune, a faithful reader of my blog since its inception. If you like what you read, feel free to like, comment, follow this blog and let’s not forget join the Socialist Party. Nationally, the Trade Unionist and Socialist Coalition (TUSC) is standing over 100 parliamentary candidates and over 600 candidates in local elections this May. 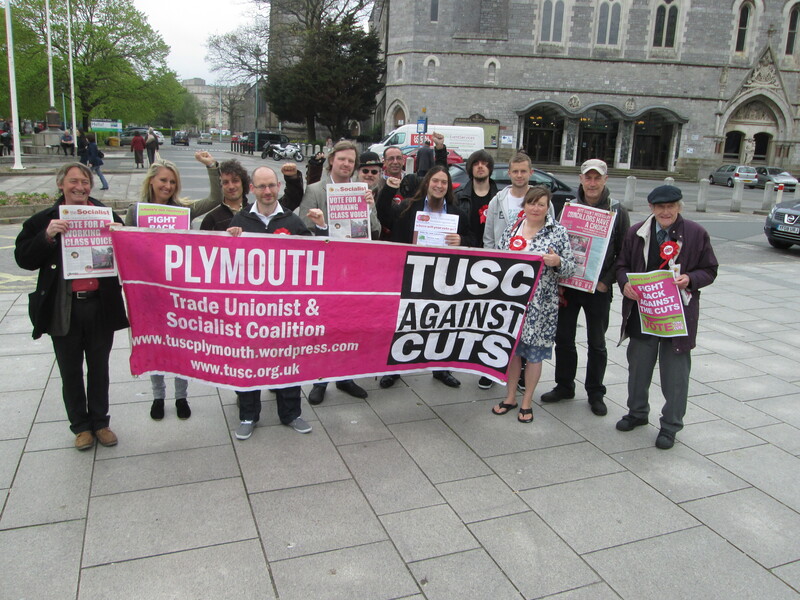 In Plymouth, TUSC managed to stand in all 19 seats last year, securing over 1,150 votes the first time we stood across the city. This year, TUSC is standing another 19 candidates in the local elections. This means that every voter in Plymouth will have the chance to vote for an electoral alternative that will protect public services and will not implement austerity. Across Europe there is a growing rejection of austerity and TUSC is standing as widely as possible to give expression to the same mood which exists here in Britain. This is a very ambitious task as it means standing the biggest left of Labour electoral challenge since the end of the Second World War. This is made more challenging as it is not free to stand in the General Election. Each candidate has to put forward a deposit of £500. This means that nationally, TUSC is having to put forward nearly £70,000 just so that we can stand our parliamentary candidates this May. This is before we even begin to take into account the costs of mounting our election campaign. It is for this reason that TUSC have to think seriously about where we can have the biggest impact to ensure that we are able to reach the widest number of people as we simply do not have the resources to contest all 650 seats this May. As we will be standing in every seat in the local elections in Plymouth we will already be making in-roads from last year’s successful campaign. By focussing our efforts in the Plymouth Moor View constituency, we can strengthen the gains that we have already made and develop the profile and grass roots support of TUSC. At the same time, by not standing a candidate in Plymouth Sutton and Devonport we can ensure that the resources are freed up to be put to use in another constituency where TUSC has not built such firm foundations. This will ensure that the banner of TUSC is raised higher than ever as the need for a new workers’ party could not be more stark. All the main parties are committed to implementing austerity. The Con-Dems have ruthlessly cut funding to local authorities and Labour have committed to Tory austerity measures if elected. Moreover, the Greens have implemented austerity where ever they have been in a position to effectively oppose austerity such as in Brighton and Bristol and UKIP in Plymouth voted against the implementation of a living wage for Council workers. It is clear that there is a need to build a new workers’ party which will oppose austerity in word but also in deed. Plymouth voters are invited to cast their votes for the only electoral alternative which will protect jobs, public services and will invest in the people who have had to bear the burden of a financial crisis that was not caused by them. Plymouth TUSC remains committed to campaigning for a £10 an hour minimum wage, building social housing to stop the spiralling housing crisis and will set a budget which protects jobs and frontline services, without shifting the cost onto Plymothians through raising council tax.